1981 Ferrari 308 GTSi in "National Lampoon's Vacation"
The screenplay was written by John Hughes, based on his short story "Vacation '58" which appeared in National Lampoon. The original story is a fictionalized account of his own family's ill-fated trip to Disneyland when Hughes was a boy. The success of the film helped advance his screenwriting career. 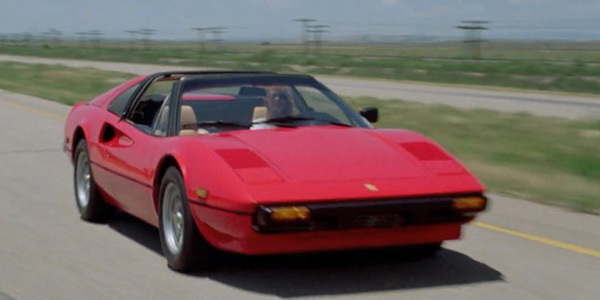 Possibly one of the most memorable moments of a girl in a car in all of movie history was when Clark Griswald sees Christie Brinkley in this red 1981 Ferrari 308 GTSi. It was movie magic and made not only Christie Brinkley a super star but made this particular Ferrari unforgettable in the minds of anyone who saw this scene. I can't find any documentation on what happened to that original car. Most likely it is in a studio warehouse with other movie props. Hughes was good at getting special personalized plates for the special cars he puts into his movies. Every one remembers these California blue plates LOVE ME.